Get above many of Manhattan's high-rises at Top of the Rock, with an unobstructed, 360-degree view from the 70th floor. 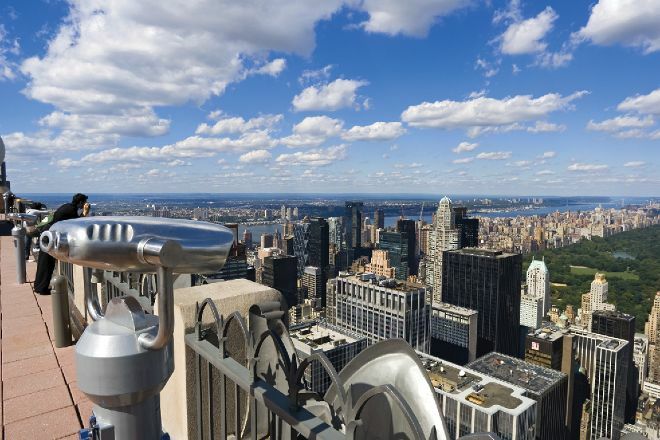 You can also gaze far and wide from protected outdoor terraces on the 67th and 69th floors. After a renovation that kept it closed for several years, the deck reopened in 2005. Designed to resemble an ocean liner's deck, the observation deck offers a bird's-eye view of many of the city's iconic buildings. A timed entry system helps keep the lines shorter and the experience less crowded than at other viewing platforms in the city. Save even more time by purchasing your tickets online. Take a look at our New York City attractions planner to schedule your visit to Top of the Rock and learn about what else to see and do during your holiday. Having already got in the Empire, I wanted to try from the Top of the Rock! I must say that even if it is lower, the great thing is that you precisely the view of the Empire and of course on everything else. There are 3 levels which are accessed by an escalator and the view is very good as the fences are low then make you enjoy the spectacular view. I went to the sunset ... so that we can appreciate the view day and night. Good vision! In all the times I've been to NYC, I've always gone to the top of the Empire State Building. But this time we wanted to try something new. We went to the Top of the Rock (Rockefeller Center) and I'm so glad we did. I prefer this view over the Empire State Buildings...because the Empire State Building is IN this view! So it makes the pictures all the more iconic and breathtaking. I loved it. There are several levels to the observation deck which adds to the wonder of it all. The staff was great, and the security guard took our picture in a really fun way! We stayed up even longer than I expected because we enjoyed it so much. My daughter and i agree, this view was superb! It gave you the iconic New York look, with the Empire State Building in the background. You could also see Central Park very nicely. We had gone to Empire earlier, but loved Top of the Rock. I felt more comfortable at Top of the Rock as well. There were three levels of viewing, all worth taking a look. My knee was giving me trouble on this trip. The stairs that I needed to walk to get to each level weren't a problem at all. Very good time.